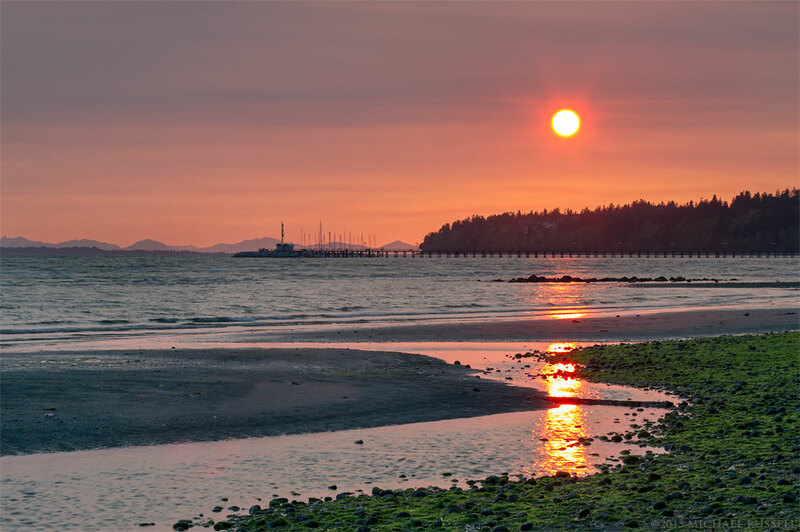 Sunset from East Beach in White Rock, British Columbia, Canada. Air pollution and/or smoke from a recent fire in Squamish account in part for the atmospheric conditions. I’ve often joked that I only photograph sunsets if my back is to them. This is often true as a nice sunset will cast some interesting light on various subjects – from plants to mountain peaks. I find most sunset photographs uninteresting unless they have a subject enhanced by the evening light. A sunset on its own is not generally one of those subjects. 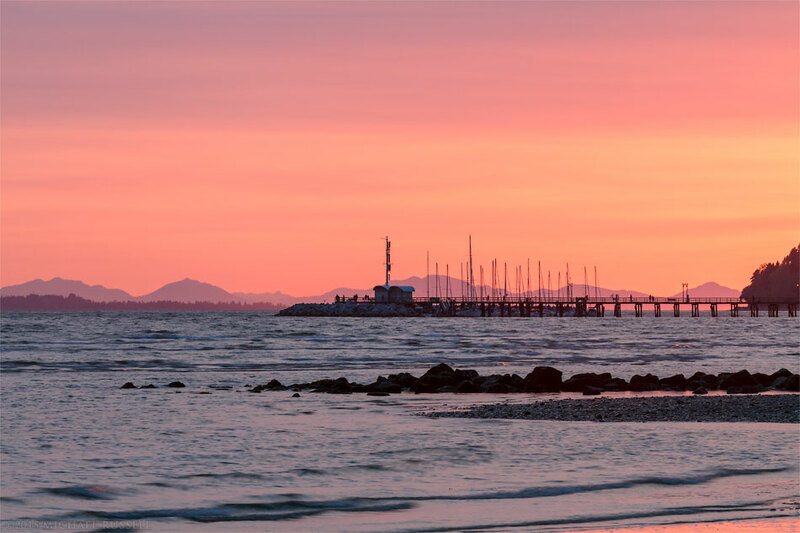 The pier at White Rock, British Columbia makes a good subject in the evenings, and the foreground in the first photograph here helped. I can’t think of very many recent photographs I have made where the sun is in the frame. This is something I tend to avoid, even though those “sun peeking out from behind a tree photos” seem popular these days. The top photograph illustrates this best, but this evening had an atypical haze and coloration in the sky. I presume this was a combination of smoke from a rather large port fire in the City of Squamish (the night before) and pollution from Vancouver. I believe this caused the halo around the sun as well. I’ve had several times when smoke from fires of various sorts have either enhanced atmospheric conditions or just made them unworthy of pursuit – I’ve been “smoked out” on a number of occasions. I think this made the photographs here more interesting, though the somewhat unnatural colors have to come with an explanation. I always try to avoid “overcooked” colors, but this one matches the way things looked on this evening at White Rocks East Beach. I did have to do some toning down of the saturation in the sky to get to this point, however. You can view more of my photography from White Rock in my City of White Rock Gallery.